What Is FAR-Infrared Sauna Therapy? Radiant energy can be found from the sun, but we know that too much sunlight can be damaging. FAR-Infrared Radiation Therapy (FIR) therapy is a safe and effective way to deliver the body the energy it needs without the dangerous effective of solar radiation. FIR is not radiation but rather an energy that travels through the body to nourish damaged tissues by increasing circulation. Drawing energy from heated objects by light conversion, we are able to warm the body using energy within the five to 15-micron level. FIR therapy penetrates tissue deep within the body, transferring light energy into heat energy. This holistic healing process causes blood vessels and capillaries to dilate, promoting better blood circulation ridding the body of toxins and metabolic waste through sweating. FIR therapy can be used in the treatment of disease and drug addictions, as well as a form of therapy for general well-being. Studies have shown that routine use may also allow the body to become more flexible. 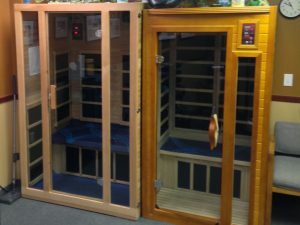 What makes FIR different than your traditional sauna? With its distinct advantages over your traditional sauna, you will not find the same relaxing and invigorating experience any other way. Traditional saunas increase the temperature in the room, making hard to breath as the air surrounding interests in temperature. Warming the body similar to the sun, FIR therapy uses wavelengths to increase your internal body temperature. Different than a regular sauna, FIR therapy works by heating the body directly instead of the air, resulting in deep tissue penetration. As the body sweats, it receives all the benefits of a sauna, without the hot air. Because of the constant heat in a sauna, bacteria can grow and create an unsafe environment, yet again making a FIR sauna much more effective and safe for all ages. To find out more about FIR therapy, or to schedule your appointment, contact us today.